Welcome to the 18th Annual Charity Wine Tasting Event, a sampling of wine, beer, & spirits with music, food, auction items, games and more. Join us on Friday, May 3, 2019, at the Great Bend Event Center in Great Bend KS to indulge in a delicious feast for all of your senses! You must be 21 or older to attend this event. Tickets for the 2019 Wine Tasting Event on sale now! 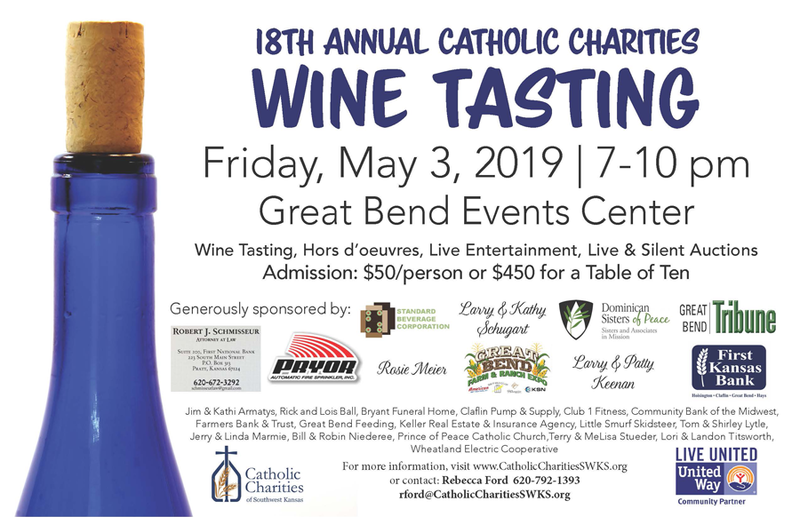 Tickets are now on sale for the 18th annual Catholic Charities Wine Tasting Event! Admission is $50 per person or $450 for a table of ten. Tickets are available online (below) for a small additional fee, or in person (no additional fee) at the Catholic Charities office at 2201 16th Street in Great Bend Kansas. Tickets will also be available at the door for an additional $1 over the ticket price. If you have any questions, please contact Rebecca Ford at 620-792-1393.